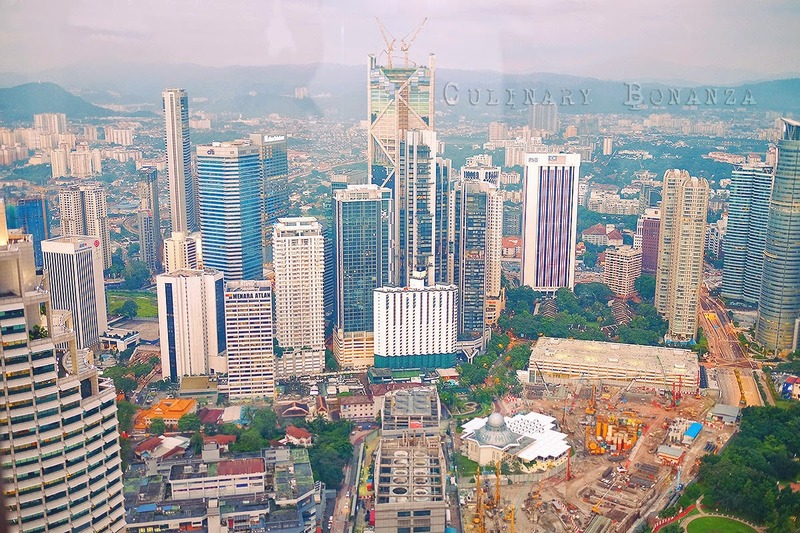 Kuala Lumpur is a massive, sprawling city, a less sterile version of Singapore interconnected with arteries of highways, a metropolis city like Jakarta, but with less traffic jam and air pollution. It is so massive that each sub-regions are mostly connected by highways and even the distance from the airport to the nearest suburb is about 60km, go figure! That's why drivers in KL (in my opinion) are quite aggressive and reckless (oh they speed up alright!). It is a fascinating place, nonetheless, with the government imposing strict laws on their Muslim citizens (anyone caught drinking alcohol or doing deeds forbidden in the religion, would be severely reprimanded, we're talking about caning or worse! However, for the rest of us, KL is a vibrant multicultural city with much to offer and discover (if you know what you like and the right places to find). 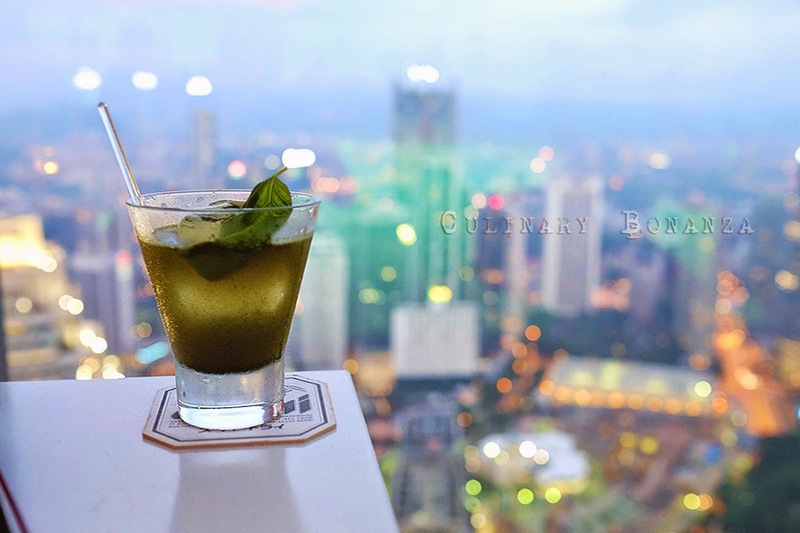 In this post, I'm going to share with you, the things you can do, the places you can visit & see, as well as places to dine and chill at, if you have less than 72 hours in KL. From the previous post, I've already shared photos around the hotel, for the full spread, just click the link. KL is about 3 hours flight from Jakarta, and due to different time zones between the two cities (KL is GMT +8), so by the time I arrived KLIA, cleared the immigration, claimed baggage, took a taxi to the hotel, it was already quite late. The closest entertainment hub to PKLB is Bangsar area, which we visited at almost 9 PM. Luckily the shopping mall was still open, so we went and grabbed some small necessities, then walked a little bit around the rows of restaurants, cafes and bars, which are still open, but not the type of place for my Mum. I would've liked to chill at one of the spots, which seem to all be flocked with night crawlers and weekenders. Gotta say the traffic jam is quite bad in this area despite the late hours, reminds me much like Kemang, albeit still much better and the traffic didn't halt to a standstill. 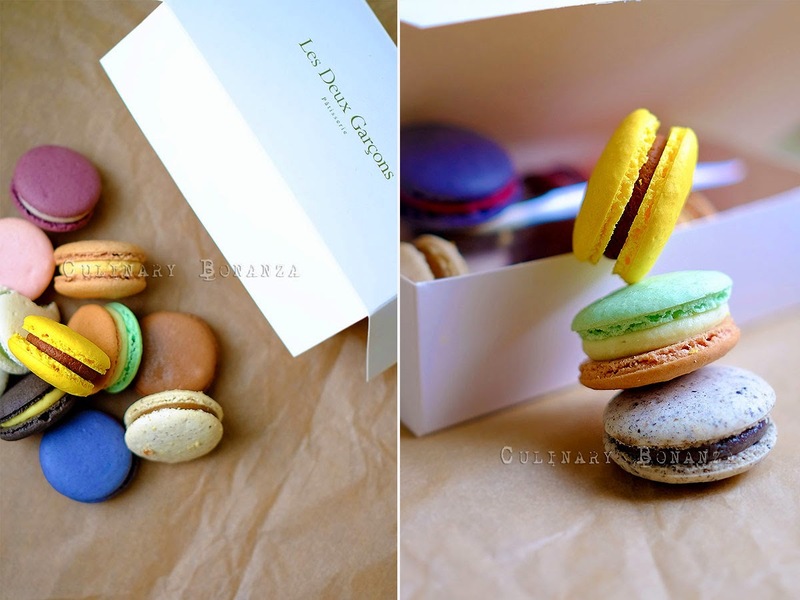 I searched for the best local macarons and found out that Les Deux Garçons comes on top of most of the results. Lucky for me, one of the stores was located quite close to Pullman KL Bangsar. A box of 12 macs cost me RM55. I had wanted to try the truffle flavoured mac, but it would cost RM 10 each, so I just stuck with the standard dozen set. If you have some space in your tummy, I'd recommend you to try the patisserie or the viennoiserie as well, perfect for coffee (or tea) time. There are tables outside the store, where you can sit at, enjoy your treats, while watching tourists and cars slowly passing by. Sungei Wang Plaza is a shopping paradise for (shameless) bargain hunters like me. This is where you can find the stuff sold at online shops, which you normally have to pre-order weeks to months in advance and of course cost more than it should if you purchase from the source. A piece of blouse can come as cheap as RM 10 and a dress as little as RM 25, if I had not practiced yoga, I would've used up all of my Ringgit here LOL! The prices are definitely worth it (don't expect premium quality, but the goods are truly decent for the ridiculous price) and depending on the shops, sometimes you can even still bargain. Here you can find fashion for ladies mostly, from babies to adults (not so much for ladies of my Mum's age), fashion accessories, shoes, etc. 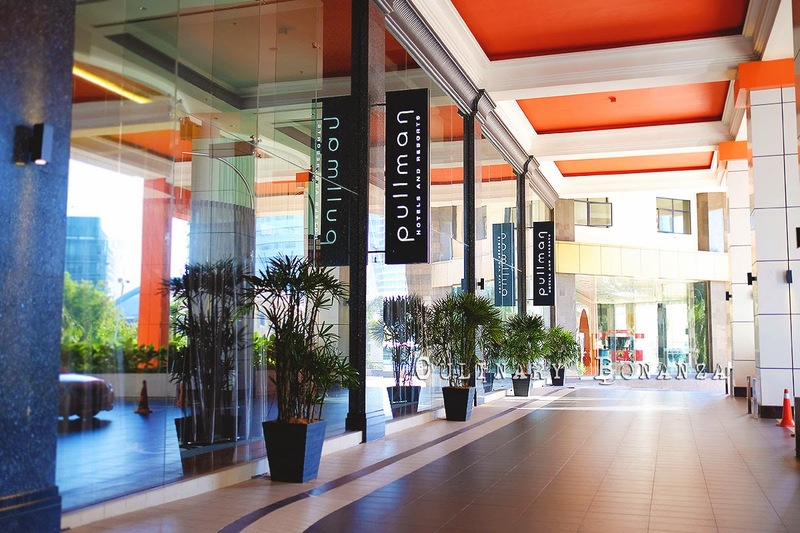 The building is clean, well lit and air conditioned, and there's even a food court at the top floor. The only foreseeable problem I can see is resisting the temptation to splurge on the good bargains. 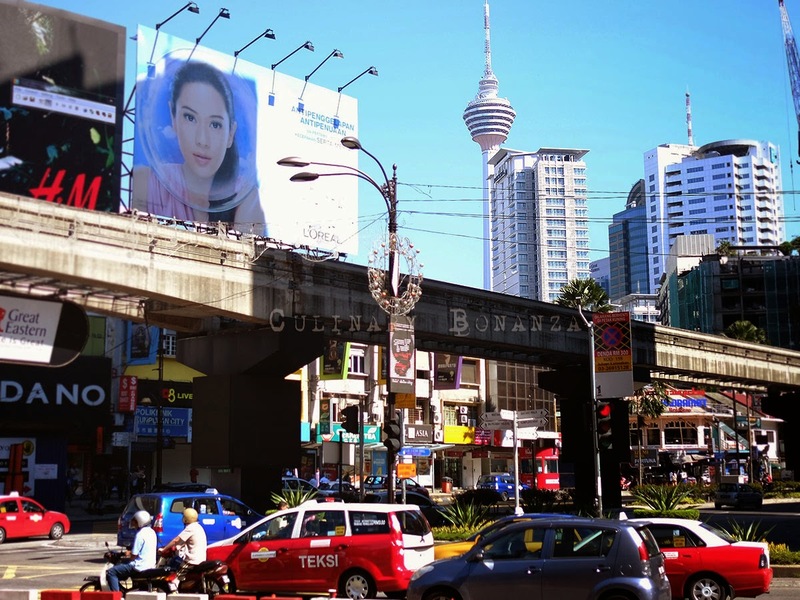 KL's version of Singapore's Orchard Road, Bukit Bintang is within walking distance from Sungei Wang, it is a famous tourist destination, where five star hotels, high end labels, shopping malls such as Lot 10, Fahrenheit 88, Pavillion KL, Low Yat Plaza, etc, the list just goes on! Don't even need to mention about the restaurants and food courts here, there's just too many to choose from. For a shopaholic, you'll be guaranteed to spend at least half of your day here, be prepared to walk away with much lighter wallet (or heavy with credit card receipts LOL). 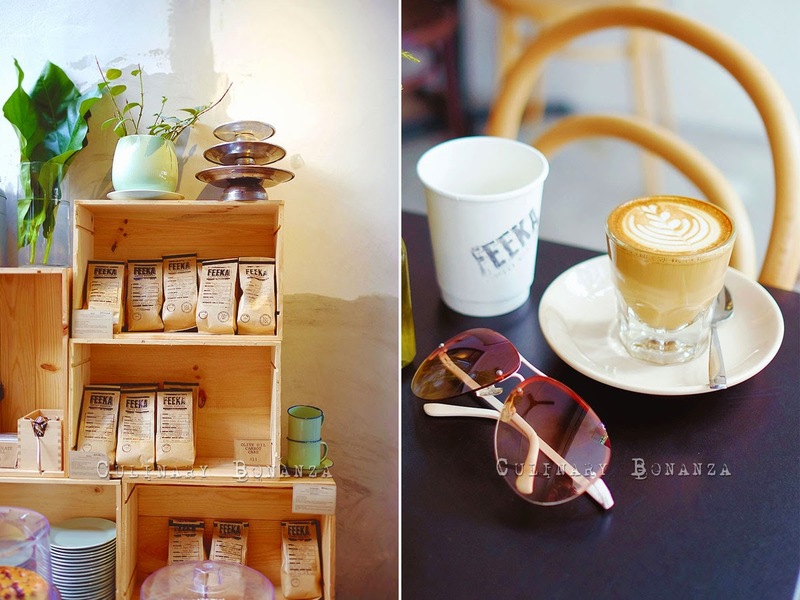 For gourmet coffee hunters, this coffee house is tucked in a rather quiet street some 700m away from the bustling Bukit Bintang. Not that secluded though, but it is hidden among the towering buildings around, lucky our taxi driver was able to find it. I would've walked there. Feeka, a narrow but cosy house converted into a cosy coffee shop, has an open air (smoking) lounge outside, plenty of seating, but might be rather cramped, especially when the place is packed. 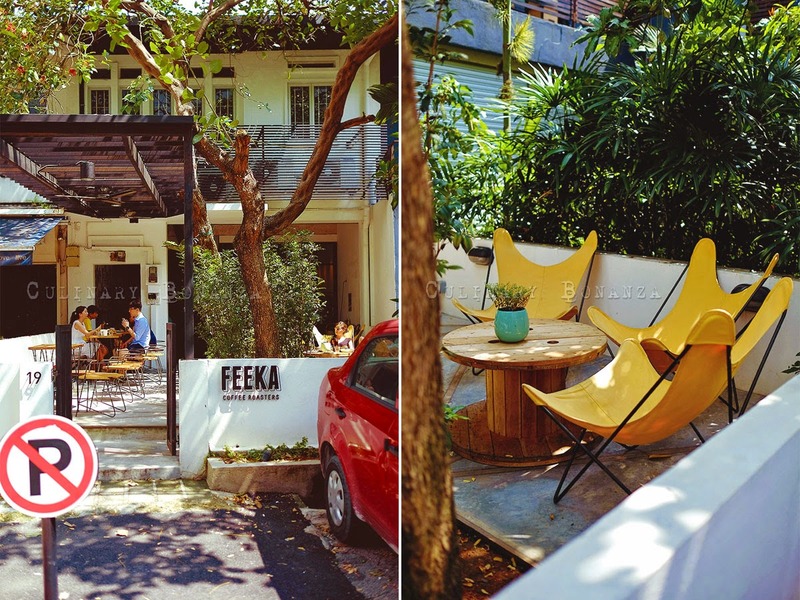 Derived from a Swedish term meaning “have a break with a drink and some food", Feeka is one quite cosy spot to take a quickie break from work or whatever routine you are doing at the moment. 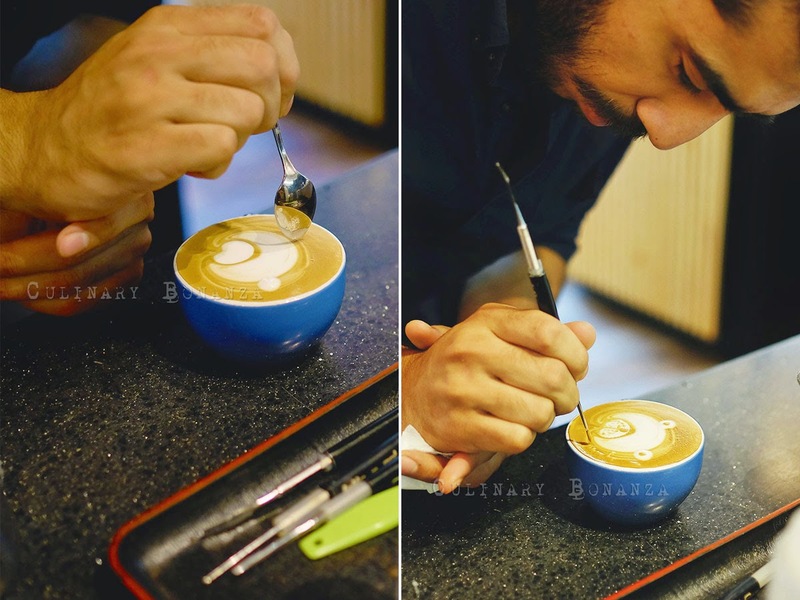 Oh I must remark that the baristas are damn good looking LOL! The dessert selection are so tempting, but too bad I was still quite full from lunch. Prices of drinks range between RM 7 - 18 (espresso, Specialty Brew, Cold Brew, Teas, etc). Whole beans are available for sale as well (RM 36-45). Ongoing promotion at Feeka: if you're in the area between 9 AM - 10 AM, drop by feeka and you can get 1 free 1 coffee of any choice. Central Market or Pasar Seni (art market) is another famous tourism spot, where one can look for signature malaysian souvenirs and (mass produced) art pieces, traditional clothings (nyonya kebaya, hand embroidery, etc), fabrics such as batik, etc. Albeit rather pricey, the goods sold here are of good quality and decent enough to be given as presents for people back home. I personally only went there to look around, as these are not things which I cannot find back home in Jakarta. If you have the time, make a visit to Merdeka Square (Dataran Merdeka), which is about only 500m away from Central Market. Basically it's just a place for sightseeing, unless you visit the Muzium Serajah Nasional (National History Museum). 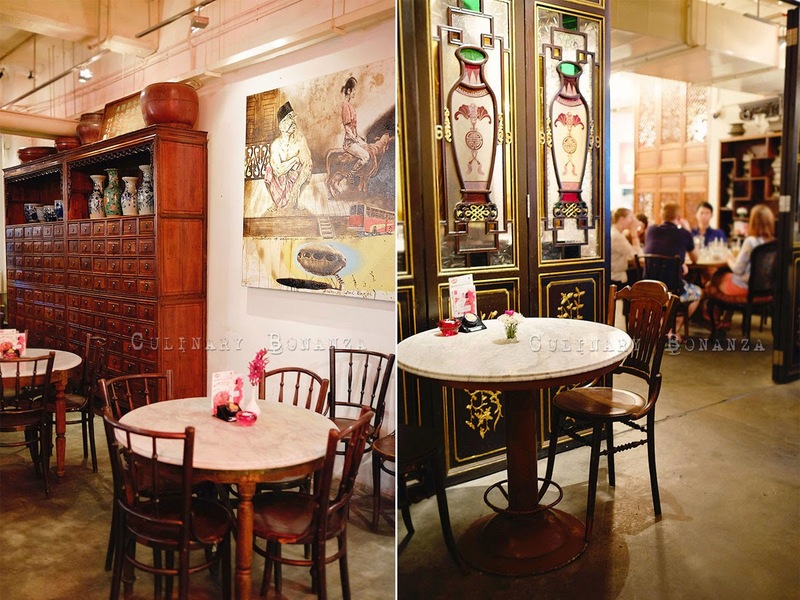 Precious is a peranakan restaurant tucked in one corner of the second floor inside Central Market. From the outside, it does not look attractive at all, but as you step inside, you'd surprised as you're being taken back in time. 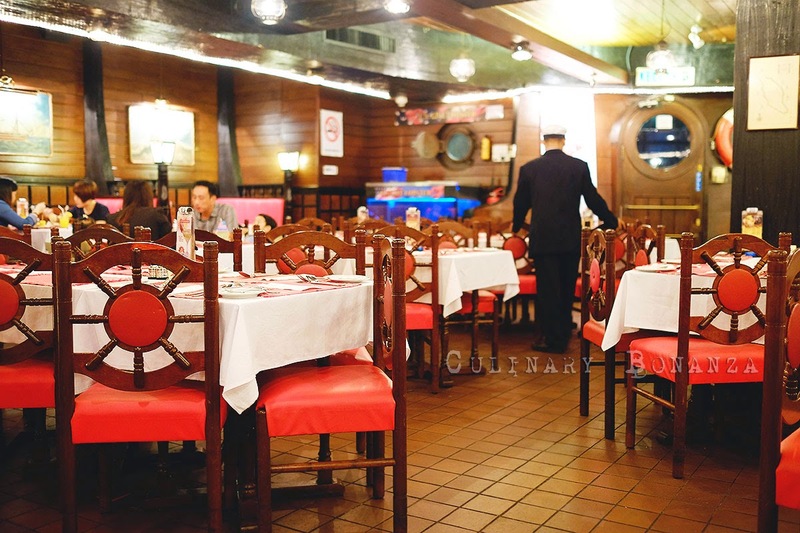 The old chinese decor, furniture are made to mimic old nyonya & baba house, but with more dominant chinese influence. What's even better, the food served here taste good, quite to my liking (I'm quite neutral when it comes to familiar food, such as Chinese / Indonesian / Peranakan, as I am accustomed to eat them at home, so to impress my taste buds is actually quite tough). 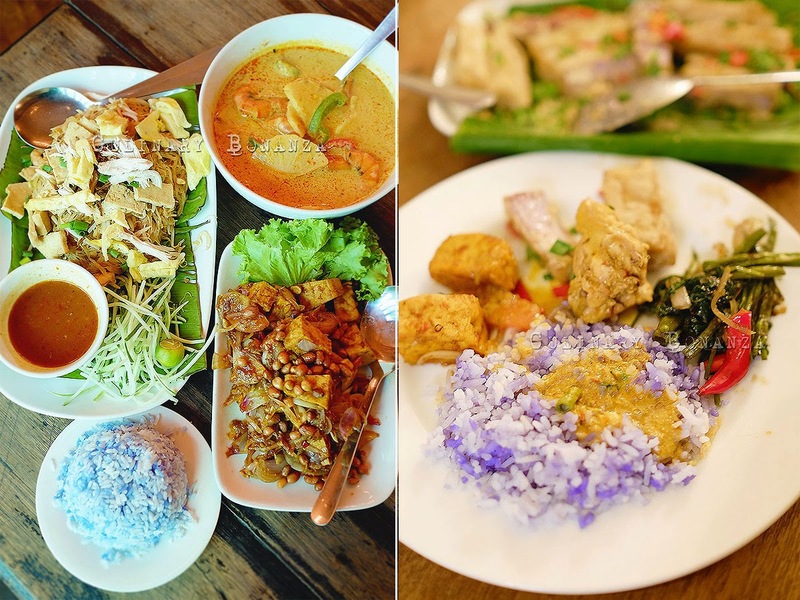 I love the fragrant purple pandan rice, which goes perfect with the Baba Curry Chicken. 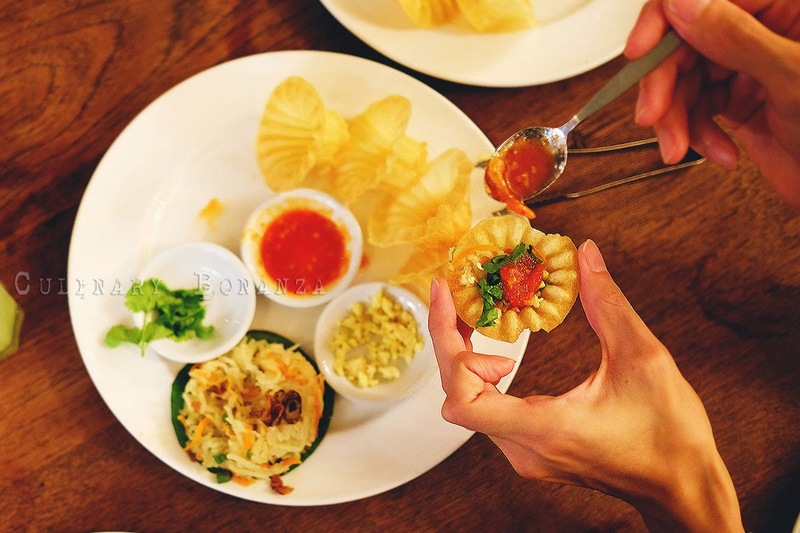 You must also try the Kue Pieh Tie (top hats), which are crispy hat-shaped rice-flour cones, and you fill in the available fillings: minced chicken, sweet turnips, carrot, best served with the chili sauce. 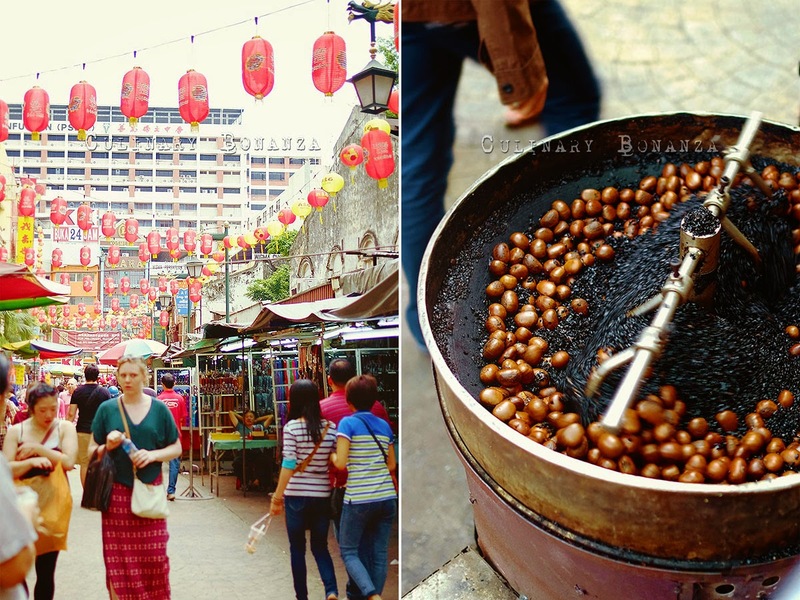 Petaling Street, KL's Chinatown is located only 400m away from Central Market (totally walkable distance). As you walk past the massive red gantry saying "Petaling Street" in bold, you will be welcomed by endless rows of shops and temporary stalls selling, again, touristy stuff, fashion, accessories, etc. Don't mind the vendors calling out to you to have a look, just shake your head courteously if you have no intention in buying anything. Both I and Mum enjoyed taking a look at the myriad of stuff sold there, only to occasionally stop by to check out some items or to buy fresh cut fruits and freshly roasted chestnuts (my Mum's ultimate favourite! She even insisted on returning the next day to get more of them!). 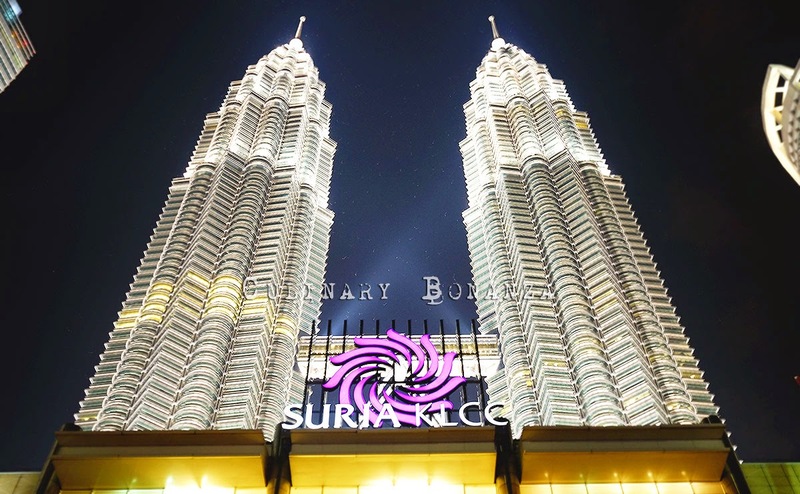 Going to Petronas is totally free (except the taxi fare or the LRT charge), if you just stay on the ground, meaning, not going up the escalator to the top floor, all you need to do is to walk outside, exit the Suria KLCC mall and stand at the base and snap some photos. 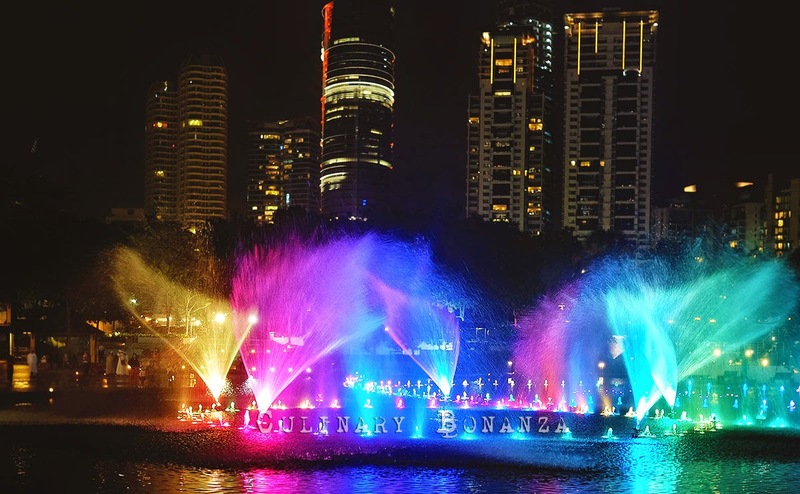 Admire the mightiness of the building from the outside, or just enjoy watching the fountain just at the back of Suria KLCC. On the last day of our stay in KL, I took Mum to Petronas. We initially wanted to take the lift up the top floor, but it would cost at least RM 80 and according to my friends, would require us to queue to get the tickets. I'd actually tried to book in advance a few days prior to our arrival, but the tickets were sold out. I reckoned our chances of acquiring walk in ticket would be slim. But first, a cup of good coffee after dinner As I was having dinner with a few new friends that night, we felt it was still too early to call it a night. So, we decided to visit Petronas Towers and first grabbed a late evening cuppa at Espressolab. Delicious brownies, interesting flavours of gelato and of course good coffee. 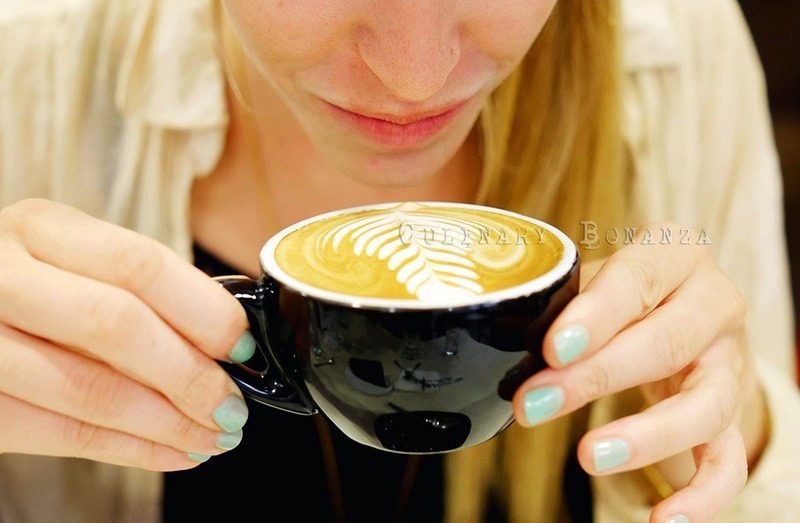 Apparently Espressolab is a big chain of gourmet coffee store, which can be found at most of KL's major shopping malls. So, your yum cha experience need no longer be reduced to only S***ucks or Coffee Bean and *** Leaf anymore. Since we were at Suria KLCC, I took another quick coffee break at Six Degrees Coffee. 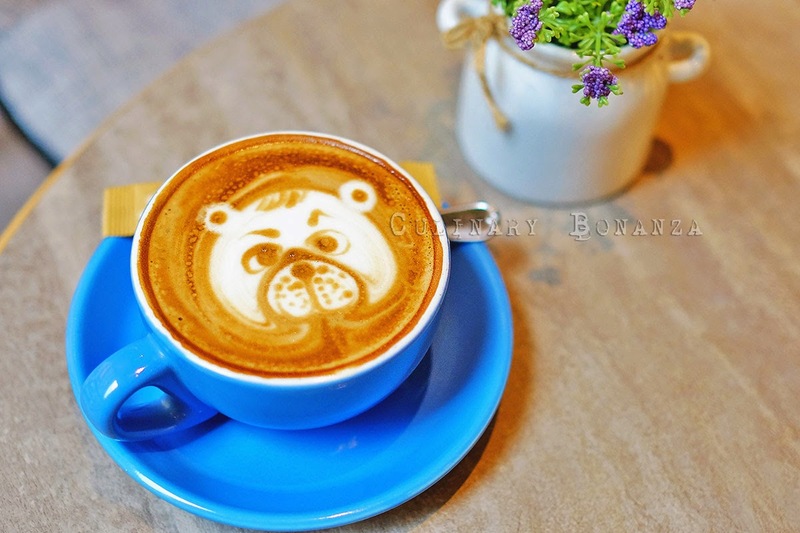 I went there with Mum and was pleased to be given a cup of coffee with a bear latte art from such a passionate barista! Full list of other Espressolab locations, click here. 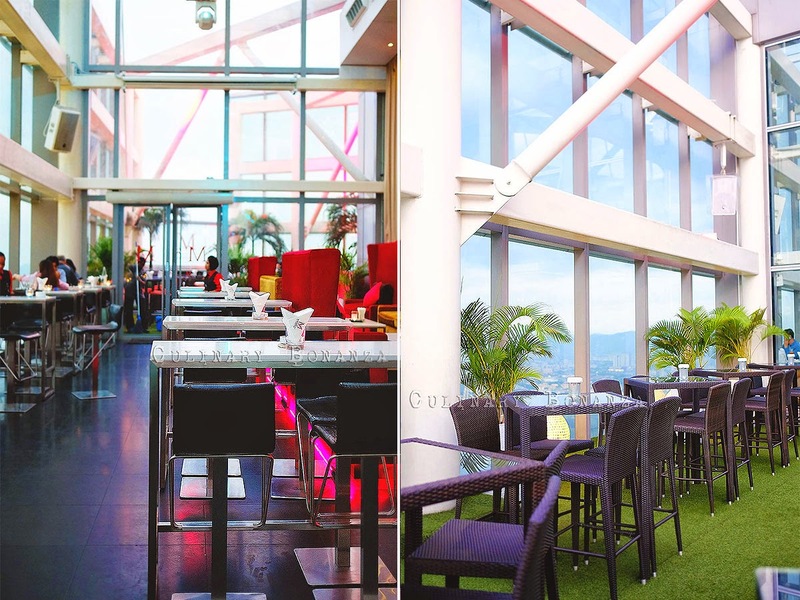 Marini's on 57 or M57 is currently one of the most happening rooftop bar & restaurants in KL. 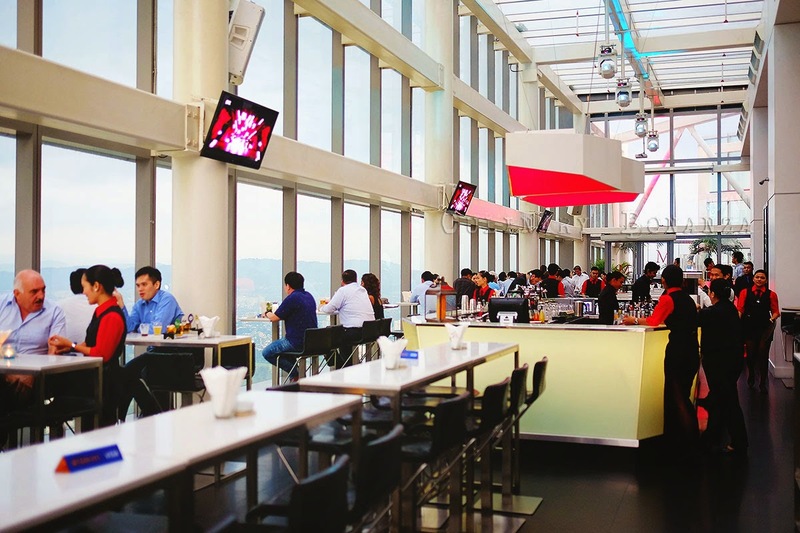 The entire area is divided into 3 parts: Lounge, Bar and Restaurant. M57 is the place to go to catch sun set (or what they call golden hour). Reservation is highly recommended, especially on weekends. I went on a monday, so the crowd was alright, not overwhelmingly packed. I went there for a couple of drinks (I opted for the Sunset hours cocktails, which offers a selection of draught beer, champagne, sparkling wine, wine, spirits & cocktails) a glass of Stratishla Cocktail for RM 25. If you don't mind the price, and you only come to M57 occasionally, do try dine at the restaurant (although a friend told me it's not quite worth the price, you don't come to M57 everyday anyway, unless you live in KL). - Bar: Opens from 5pm onwards. Two terraces on each end with the main bar in the middle. One is directly beside the Twin Towers. - Lounge: Opens from 3pm onwards. Does not overlook the Twin Towers. Minimal food selection. - Restaurant: Opens from 7pm onwards. Overlooks the Twin Towers. Italian Menu. It's quite late (still early for my friend's clock though) around 9 PM and we had yet eaten dinner, so I was shown to this place in uptown, about 40 minutes drive from KLCC. We were supposed to go for this super good roti pratha restaurant, but it was closed (bummer!). But we ended up dining at this restaurant called The Ship, which opens until quite late (good option for late diners). And boy, the portions are massive! I couldn't tummy everything in. Just like its name, the restaurant decor mimics that of a ship, even the crews are in navy uniforms. I was surprised to find it still quite packed when we arrived around 10 PM. For other locations of The Ship Restaurant, click here. Yes, you can actually catch a cab that uses a meter from the airport and pray that the driver does not take you on a detour around town. But alternatively, a safe and guaranteed safe method is by taking the fixed-price taxi from the airport, which you can order at the counter located after the baggage claim area and just before reaching the exit. A trip from KLCC to Bangsar had cost me RM 74.30. Rather sadly, for a metropolis city like this, the taxi drivers are sometimes not well mannered, especially those who form a long line of taxis by the street, waiting to tout unsuspecting tourists, AVOID them at all cost. My suggestion is that unless you're willing to pay or are desperate, do not entertain their questions or offers at all. Just pretend to be deaf and walk away or further down the road to hail any incoming taxis or order one to pick you up at your current location using this app called MyTeksi (available on iOS and Android, Windows & Blackberry). All you need to do is register using a valid local mobile number so the driver can call you. I actually quite enjoyed my trip to KL this time round, despite a little unpleasant encounters with a few taxi drivers. If given more time, I would have liked to visit Batu Caves (the famous Hindu temple with the massive gold statue, situated some 13 km north of KL). It was definitely a trip which I will never forget and I'm truly thankful that I made this trip, on the fated date, on that fated flight. I believe everything happens for a reason, even though I'm still unsure of what may come in the future. Will I visit KL again? Yes I might, not so much for shopping / sightseeing though, perhaps to visit someone, whoever knows :) Until we meet again KL! Extensive El. I've been hesitating to visit Malay for a while. I see there's not much street / hawker food worth mentioning on? Or is it just you don't get the chance to check them out? 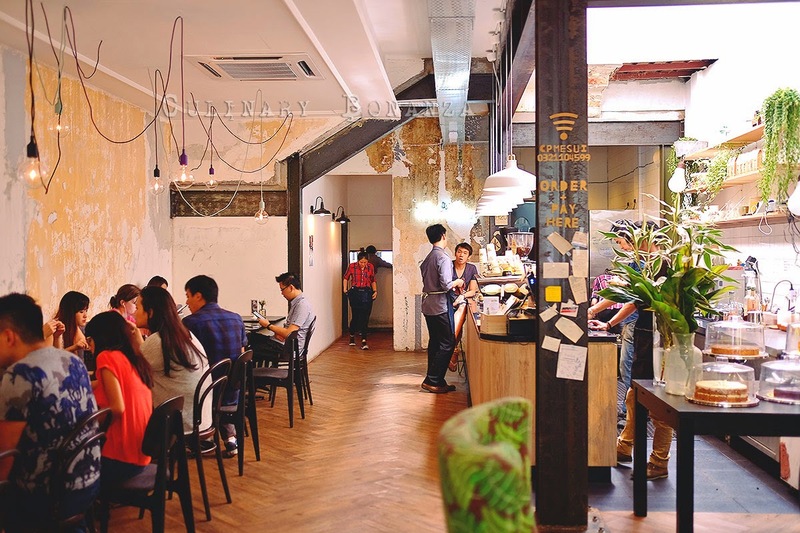 Generally, are the food better than Singapore? Anw, thumbs for the roasted chesnut. My fav too!